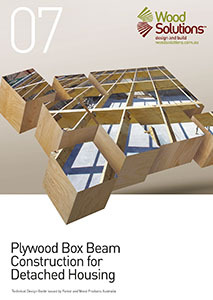 Plywood box beams are lightweight, structurally efficient, economical and simple to fabricate. They provide a conventionally stable means of structural support for building construction. This design guide provides a series of span tables designed according to the limit state design theory and for wind speeds up to N3 for detached single and two-storey houses. These span tables introduce new options for beams incorporated into walls, portal frames and other typical long span applications.